From classmates to a “tulay” [bridge] to the best of friends, Jec and Freda learned that the best love stories are the most unexpected ones. 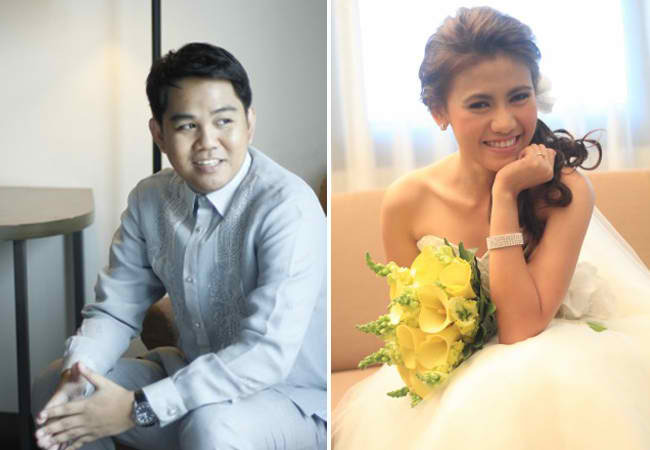 Last April 2013, the awesome twosome celebrated a yellow summer wedding in Sta. Rita de Cascia Parish and Patio Ibarra. Jec and Freda have known each other since their first year in college. They became friends when Jec asked Freda to become his “tulay” when he was courting one of her classmates. Maybe it was destiny that Jec didn’t win the girl that he initially wanted but he was happy he got something better – he found a friend that later turned out to be the love of his life, Freda. Jec and Freda wanted a yellow summer wedding that was light and fun. Everything was in yellow – prenup, wedding shoes, misalettes, entourage dresses, flowers, candles, reception, styling, cakes, candy buffet and all! To keep the theme light, Jec and Freda wore sneakers as well. The couple was 101% hand on with their wedding planning, scouting for the best wedding suppliers in the wedding expos and the internet. Fortunately, they were able to organize the best team for their dream wedding. Paulo Sia Studios. Jec and Freda love Paulo’s looks and his work. They were especially fond of his team that made the pictorials light and easy with their funny personalities. Paulo was very keen on details and all the couple’s requests were delivered. In just two months after the wedding, their wedding album was already ready for printing. Patio Ibarra and Ibarra’s Catering. As Freda recalls, “There are many reception venues near Sta. Rita – Plaza Ibarra, Patio Ibarra, Bella Ibarra, Elements at Centris, Gazebo Royale, The Grand Terrace, Blue Gardens, Lights of Love, Fernwood but we chose Patio Ibarra because they did not have a rental fee and the space was enough for 180 guests complete with stage area.” She was also very excited to describe the food as the guests really loved all of what they served – the big servings of lechon, pasta and an array of scrumptious viands. They were also wowed by the beautiful reception set-up and flower arrangements. The couple was especially happy that they were able to follow through with all their specific requests. Exclusively His & Her Couture by Bong de Ocampo. Freda was amazed at how handsome Jec was with his gray barong, pants and camisa. They were happy with the service as it was quick and hassle-free. Jec and Freda also had their fair share of mishaps during their wedding planning. But when they look back to their wedding planning days and the culmination of the big day itself, they cannot help but smile for it was only the beginning of a new life as husband and wife. Look at this Hello Kitty-Themed Wedding!